Poop Johnson stole the headlines but Micah Johnson secured the bag. The former Kentucky linebacker and three-time CFL all-star has signed a one-year deal with the Saskatchewan Roughriders. TSN’s Michael Scianitti reports Johnson will now be the highest-paid defensive player in the CFL, making north of $250,000 in 2019. After short stints with the NFL’s Cincinnati Bengals and Miami Dolphins, Johnson spent the last six seasons with the Calgary Stampeders. In 2014 and 2018 he helped the Stamps win the Grey Cup. 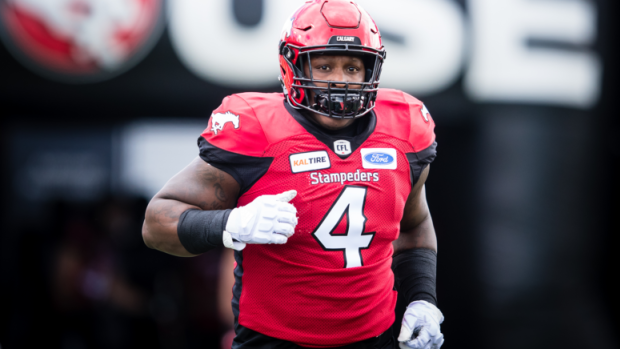 Last year Johnson was named a CFL All-Star after totaling 29 tackles, 14 sacks, one interception and three forced fumbles. Kentucky’s Mr. Football out of Ft. Campbell in 2005 has made a nice living as one of the CFL’s best defenders. After watching his highlights from last year, you’ll understand how he earned this payday. Of course, if you’re reading this, you already know how CJ got his nickname. In an interview with Alan Cutler, Johnson shared his weight loss secret: pooping. The last two years, Johnson played with the Winnipeg Blue Bombers, racking up 28 tackles and five sacks. Prior to joining the CFL, he spent time on Atlanta Falcons and Kansas City Chiefs practice squads. At UK, he tallied 77 tackles, 12 tackles for loss, 4.5 sacks, 2 forced fumbles and 1 fumble recovery over two seasons. Wait until the rest of the internet sees that. Football season is not over. This weekend the Alliance of American Football will debut and one former Wildcat is set to star. Leading into the season, the Memphis Express has gone well out of its way to feature wide receiver Kayaune Ross. A former JUCO transfer, the 6’6″ outside receiver racked up 300 yards and a touchdown in two seasons at Kentucky. Now, he is the featured athlete in Memphis’ promotional materials ahead of Sunday’s season-opener. The Express, coached by NFL legend Mike Singletary, will kickoff Sunday at 4:00 in Birmingham on CBS Sports Network. Memphis is a one-point underdog on the road. Ross will be catching passes from former Penn State and New York Jets quarterback Christian Hackenburg. 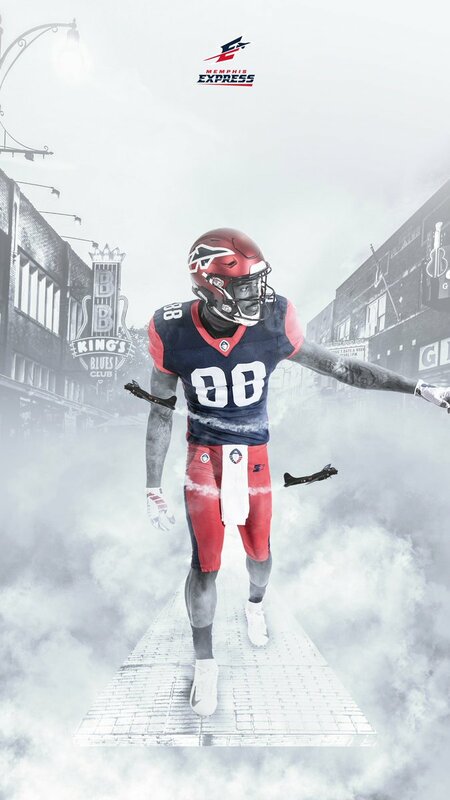 The AAF is the first of a few spring football leagues set to start over the next two years. Founded by Charlie Ebersol and Bill Polian, the Alliance’s eight teams are coached by some of the sport’s most recognizable names, starting with Orlando’s Steve Spurrier. The rules aren’t too different from the NFL. There are no kickoffs and no PATs, only two-point conversions. To fit the game into a two and a half hour window, the play-clock has been shortened by five seconds and there are no TV timeouts. You’ll find the first AAF game on national television Saturday night at 8:00 on CBS. Click here for more on America’s new professional spring football league. Week after week throughout the NFL season we watched one kicker after another miss field goals. Week after week, Austin MacGinnis waited for a phone call that never came. Finally, somebody made a wise decision. Kentucky’s all-time leading scorer is spending his day kicking footballs in a private workout with the Chicago Bears. According to Ian Rapoport, veterans Nick Folk and Blair Walsh are also in the building. MacGinnis spent time before the season kicking at Bears’ minicamp. After Cody Parkey’s infamous playoff Double Doink, the Bears’ front office felt buyer’s remorse for Parkey’s $15 million contract. If all goes well today in Chicago, the KSR Football Podcast may need to create a “Help Wanted” sign. Even though we will miss Austin, we’d much rather see him succeed on Sundays. Classes officially started last week at the University of Kentucky, and like every other student on campus, I slowly made my way through each class on my schedule for syllabus week. In one instance later in the week, I was trekking my way into the brand new UK Student Center when an individual walked past me that caught me off guard. There are thousands of students walking through campus each day, and I only had time to take a quick glance, but I could’ve sworn I had seen him before. Did I have a past class with him? Same high school? Played sports together growing up? I brushed it off and didn’t think anything of it until this morning. Making that same journey into the Student Center, I walked down a flight of stairs into the dining area, and that same individual from the week before was walking my direction. This time, though, I got a closer look at him and still couldn’t figure it out. He was 6-feet tall or so, wearing a sweatshirt and sweatpants, longer hair, etc. But the face was so freaking familiar. Bookbag on and pencil in hand, the individual I had seen twice absolutely was former Kentucky star linebacker and current New York Jet Avery Williamson. Williamson, who finished with a career-high 121 tackles (41 solo), three sacks, six tackles for loss, and two forced fumbles in 2018, is back in Lexington this semester to finish his degree at UK. After being drafted in the fifth round by the Tennessee Titans in 2014, Williamson played the first season of a three-year, $22 million deal with the Jets he signed last offseason. At Kentucky, Williamson played from 2010-2013, racking up 296 total tackles, four sacks, ten tackles for loss, two forced fumbles, and two interceptions. Congratulations to the former Wildcat great on coming back to earn his degree! Following a career season with the Baltimore Ravens, former Kentucky defensive end Za’Darius Smith is set for a pretty solid payday when he hits free agency this offseason. Finishing with career-high 45 tackles, 8.5 sacks, two pass deflections, and one forced fumble in 16 games this past season, Smith has been listed as Pro Football Focus’ No. 1 overall under-the-radar prospect when free agency rolls around this March. “The 10 players below aren’t likely to break the bank this offseason, but all could be massive upgrades for needy teams,” the description said. In his fourth year in the NFL, the former Wildcat doubled his tackle total from the last two seasons, four more sacks than the last two seasons combined, and doubled his start total from last year to this one. NFLTradeRumors.co released their list of top-50 free agents this offseason, and Smith came in at No. 34 overall. At just 26 years old, the former Kentucky pass rusher’s career is just beginning. Whether he’s with a new team next season or re-signs with the Baltimore Ravens, Big Z will be making a pretty penny when he signs his next NFL contract. Za’Darius Smith and the Baltimore Ravens face the Los Angeles Chargers in the first of two Wild Card games today. This will be Smith’s first playoff game of his NFL career. The Ravens have not made it to postseason play since 2014. Baltimore drafted the former Kentucky defensive lineman in the 4th round of the 2015 NFL Draft. Smith played in all of Baltimore’s 16 regular season games recording 45 total tackles, 25 solo and 19 assists. He’s recorded a career-high 8.5 sacks and 1 forced fumble. The Ravens defeated the Chargers 22-10 in their regular season matchup on December. 23. The Courier Journal announced this morning that Randall Cobb will be a guest speaker at the Courier Journal Sports Awards on June 2 at the Louisville Palace. The former Kentucky wide receiver and current Green Bay Packer will be part of the award ceremony that recognizes the best in Kentucky and Southern Indiana high school sports. Tickets to the event can be purchased at the Louisville Palace Box Office or online. As someone who has seen Cobb speak in person, you won’t want to miss this. Former Kentucky wide receiver has likely played his last game in Green Bay, and he isn’t afraid to admit it. At 28 years old, the 5-foot-10 receiver has battled injury after injury over the course of his eight-year career. Following a career season in 2014 where he finished with 1,287 yards and 12 touchdowns on 91 receptions, Cobb earned a four-year, $40 million contract with the franchise. Since then, he has failed to break the 1,000-yard mark in a season and has played in all 16 games just once. This year, Cobb finished with a career-low 356 yards and two touchdowns in just eight games. Following an injury-ridden season with two separate hamstring injuries and a concussion, the Packers might believe the former Pro Bowler isn’t worth the money he could draw in free agency. The former Wildcat, on the other hand, still feels like he can play at an elite level. When asked about the idea of Green Bay potentially moving on this offseason and letting Cobb explore free agency, the former Kentucky star said he has certainly thought about it. “I’m human so I can’t say that it hasn’t crossed my mind,” Cobb said. Pictures are worth a thousand words, and the one featured at the top of this post seems to indicate the dynamic duo of Aaron Rodgers and Randall Cobb has come to a heartbreaking end. While Kentucky linebacker Josh Allen is preparing for the Citrus Bowl, things are working in his favor off the field. When he’s not raking in yet another prestigious award, the consensus National Defensive Player of the Year’s NFL Draft stock is steadily rising. He started out the year as a late-first/early-second round prospect, and then made a jump into the top-15… Midway through the year, we saw several top-ten draft grades, and then a few top-five predictions. Now, he’s seen as the No. 2 overall prospect, behind only Nick Bosa of Ohio State. All eyes will be on the Oakland Raiders next April, as they currently hold three first round picks in the 2019 NFL Draft. Their first pick, which they have earned by winning only three games all season long, will likely be focused on an edge rusher, as they traded away the best in the game at getting after the quarterback in Khalil Mack prior to the 2018 campaign. The best case scenario for the Silver and Black would be losing the rest of their games, and seeing Arizona win one, giving them the first overall pick, and selecting Nick Bosa. However, if they do end up at No. 2, they may look to go with a player like Josh Allen from Kentucky, who can fill a couple of holes on their defense next season. Allen is an elite edge rusher, and has the ability to play on the edge, as well as at outside linebacker. The Raiders have holes in both those areas, and Allen may be the best overall defensive athlete this draft class has to offer. There are a number of ways the Raiders could go here, as their defense is terrible this season, and adding a player like Quinnen Williams from Alabama also makes sense. This Raiders team is going to look a lot different next season, and the hope for Raider Nation is that they can hit a home run with their three first rounders in April. CBS Sports has Allen going No. 3 to the New York Jets. Walter Football has Allen going No. 4 to the San Francisco 49ers, as does Tankathon.com. Sources have told KSR that it will be a shock if Allen falls out of the top five this spring, as scouts firmly believe he will steal the show during testing at the NFL Draft Combine. One individual added that Allen has a fair shot at the No. 1 overall pick with a solid showing during pre-draft opportunities. After an atypical NFL Draft drought, Mark Stoops expects his senior class to make history in April. After having discussions with various NFL scouts, Kentucky’s head coach believes 11-12 players will be taken in the 2019 NFL Draft. That estimation includes two juniors, running back Benny Snell and offensive guard Logan Stenberg, who have requested official feedback from the NFL. If 11 UK players’ names are called, it would make history. Last year Kentucky had zero players drafted. Only 11 UK players have been drafted over the last seven years. The most ever taken in the modern draft era is four. To reach this level of NFL success did not happen overnight. Seven of the eleven will participate in postseason senior bowl games. If they perform well, Kentucky could make history April 26 in Nashville. After eleven seasons in the NFL, Wesley Woodyard isn’t slowing down. The former Kentucky linebacker has been named AFC Defensive Player of the Week after an excellent performance against the New England Patriots. In the Titans’ 34-10 upset victory, Woodyard pressured Tom Brady 5 times, recorded 1.5 sacks and tallied 12 tackles, one for loss. Woodyard is tied for a team-high 62 tackles this season. Even though he’s getting old, Woodyard is saving his best for last. In 2017 he had career-highs in tackles and sacks. Right now he’s on pace to surpass last season’s sack mark. The 5-4 Titans travel to Indianapolis this Sunday for a 1:00 p.m. divisional matchup. If you’ve turned on ESPN anytime over the last several weeks, you’d know about the Le’Veon Bell saga in Pittsburgh. Long story short, Bell has been holding out for the Steelers this season after the two sides couldn’t come to a long-term contract agreement this past offseason. Yesterday afternoon, the official deadline to sign his $14.5-million franchise tag and return this season passed, meaning the superstar running back would be forced to sit out the remainder of the year. Ever since, his teammates and coaches, along with the rest of the NFL, criticized him for putting money before his passion for the game and leaving the Steelers out to dry. Former Kentucky pass-rusher and Steeler teammate Bud Dupree got in on the fun, helping unload Bell’s locker this afternoon and taking his cleats in the process. A video of Dupree lacing up Bell’s Jordan XI PE cleats and trying them out surfaced this afternoon, where he gave the running back his well-wishes in the future and appreciation for his new gameday footwear. “Wish you success my guy, but appreciate the cleats man,” Dupree said in the video. “He’s probably not coming back for them,” the former Wildcat said. Can you blame him for taking them? Those things are beautiful.